I am back today to share a recent e-design project that I completed. I have worked with these wonderful clients before on their kitchen, dining room and den. We have now moved onto the foyer! It’s so fun to be a part of several rooms in a client’s home. Not only do you get to know them and establish a great designer/client relationship, but you also get to tie the design ideas into other rooms in their home. This is one of my favorite room designs as of late. I love how the colors came together, in comparison to the other nearby rooms we decorated. A foyer is your guest’s first impression of your home, so why not pack a fun punch with the design?!? I wanted to give this family a laid back, coastal style. They love the beach and I hope this design gives subtle nods to their favorite vacation spots! The upholstered bench really brings the color palette together and compliments what we have accomplished in the nearby rooms. The teal/indigo area rug color is pulled from the hues in the bench. The chinoiserie vase prints will go near the front door and it is the continuation of the blue that makes it all flow. The acrylic base of the console lamp allows the room to feel light and airy, not taking up too much visual space. They have already began putting the foyer design together and I can’t wait to see the results! Thank you so much for your question, Kathy. We found the whale at West Elm, but it is out of stock. Maybe TJ Maxx would have a similar item, especially closer to the spring. Good luck! Can’t wait to see the final result! 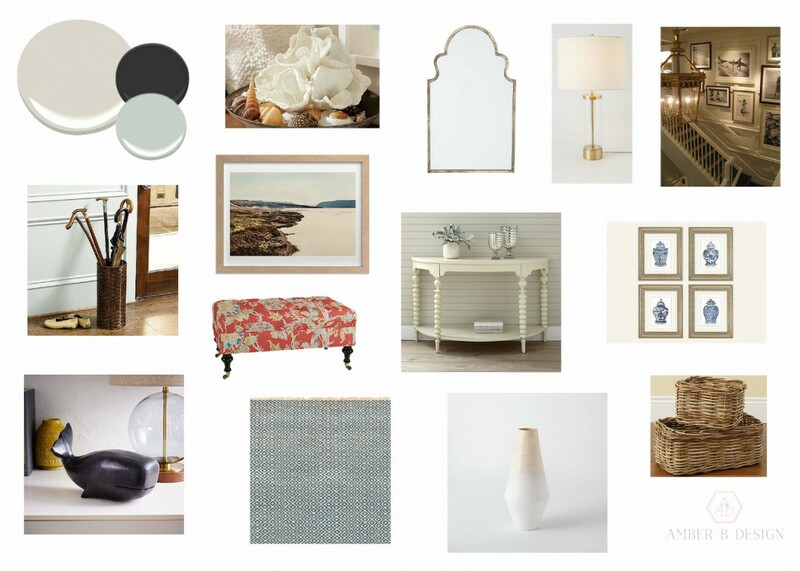 All the items you pulled together are cohesive and give that coastal calm feeling. A great way to be greeted upon entering! Thank you so much, Taylor! It will be a fun reveal. Happy Holidays! !